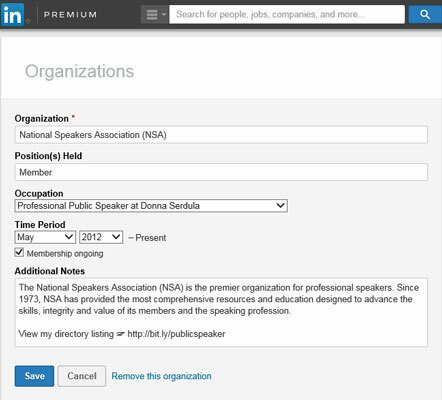 The Organizations section of your LinkedIn profile is the place to record the real-world associations and clubs to which you belong. Listing professional membership organizations on your profile proves you are an integral force within your community and an involved member within your industry. LinkedIn members often add LinkedIn Groups or their volunteer experience to the Organizations section. This is a mistake. LinkedIn Groups are forums within LinkedIn focused on a specific topic. Within a LinkedIn Group, members post and comment on discussions. It’s a great way to come together with like-minded individuals for discussions around shared interests. 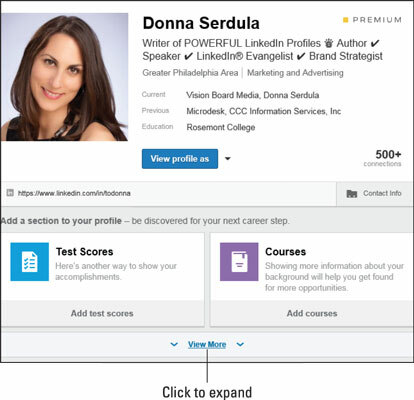 However, you do not want to list your LinkedIn Groups within the Organizations section, as LinkedIn Groups automatically appear at the bottom of your profile. The Volunteering Experience section of LinkedIn is where you list those humanitarian organizations to which you donate money or time. Not sure where to add a particular organization? To determine which organization goes into which section, ask yourself the question, “Is this organization’s goal philanthropy, and am I donating my time or money?” If so, enter it into the Volunteering Experience section. Do you belong to any user groups? Do you pay dues to any association? Are you a part of a local government organization? Do you sit on a board of directors? Make sure you include organizations that forward you professionally and are interesting to your target audience. It’s okay to leave out organizations that are of a personal nature or may alienate your target audience. Everyone has causes that move them but you must be smart about what you list on your profile. You may love animals but showing your support of People for the Ethical Treatment of Animals (PETA) may alienate some people. Likewise, listing your National Rifle Association (NRA) membership may upset others. It’s certainly fine to stand behind your convictions whatever end of the spectrum they might be on — just realize that not everyone will agree and opportunity might be redacted because of what you list on your profile. You can’t please everyone, so be strategic and think through the pros and cons prior to adding organizations to your profile. If you have the Organizations section already added to your profile, simply scroll to it and click the pencil (edit) icon to enter into edit mode, then go to Step 5. If you don’t have the Organizations section added to your profile yet, add it by scrolling below the Contact Information section at the top part of your profile. Two sections appear that you can add. If Organizations isn’t one of the options listed, click View More to expand the area to see a full list of sections to add. In the Organizations section, click Add Organizations. When clicked, the Organizations section appears on your profile. In the Organization field, type the name of the organization. In the Position(s) Held field, type the position you held. If you didn’t have an official title, such as President or Treasurer, you can use: Member, Key Contributor, Team Member, Patron, Supporter, Sponsor, Subscriber, Angel, or Backer. In the Occupation field, select the current or prior experience to connect this organization to a particular role. The drop-down list is populated by your current and previous experiences. If you are part of this organization not because of a current or past role, feel free to skip this field. By linking the organization to a position, the organization shows up in the Organizations section and directly under the position it is paired with. In the Time Period fields, choose the month and year you started your membership from the drop-down lists. LinkedIn defaults to no end date. If this organization is no longer current, enter an end date by deselecting Membership Ongoing. In the Additional Notes field, enter information about the organization. See the figure for an example of an organization added to the Organizations section.